The idea for this costume was conceived while creating last year’s Halloween costume. I enjoy creating costumes that make people think. 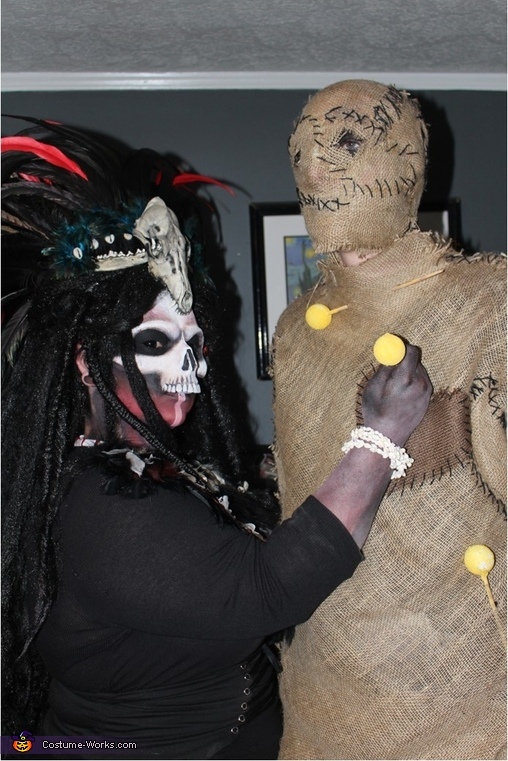 Last year we were Medusa and a Stone Warrior, in piecing that costume together I thought, “what are some other paired symbolisms that I can use to create a couples’ costume?” My first thought was the Vodou (or Voodoo) god Papa Legba, god of crossroads. If Legba was a goddess, what would she look like? To give a little back ground, in the African and Haitian Vodou religion, Papa Legba is a guardian and trickster of the crossroads. Legba is an intercessor between the Loa and humanity. He will grant or deny permission to speak with the spirits. Legba is a very important deity, he is the first and last spirit summoned in any ceremony. The weight of his importance is so great because he is able to open and close the doorway between the living and the dead. My task was to turn Papa Legba into a female. In many images, Legba is shown wearing a straw hat or decorated top hat. I turned the hat into a very elaborate headdress made from rooster feathers and a coyote skull, the rooster is Legba’s favorite animal. He is usually seen with a wooden walking stick; I took this opportunity to create a staff. For the makeup application, I added a prosthetic skull and black sclera contacts. These additions add an element of death and the appearance of looking into another’s soul before granting or denying passage. The colors used threw out my recreation are red and black; these are Papa Legba’s favorite. To create the second part of this couple’s costume I thought of the first thing that came to mind when you think of Voodoo, a voodoo doll. Although the act of sticking pins into a bundle of cloth is not actually part of the Vodou religion, it is one item that can be found all over the world and for most the first thing they relate to the religion. Voodoo Priestess- I am the wearer- I created the headdress from a Styrofoam ring that I wrapped with black pipe cleaners (Joanne’s Fabric). After ensuring that the Styrofoam was completely covered, I used 150 red and black rooster feathers (Amazon) and 3 pheasant feathers (Joanne’s Fabric) to create the headdress. I wanted to stick with rooster feathers because the rooster is Legba’s favorite animal. I inserted the feathers at a steeper angle the further back I went. This gave the feathers a cascading effect. I didn’t have to use glue to secure the feathers, inserting them into the Styrofoam gave enough stability. I secured a coyote skull and jaw bone (Etsy) that I stained with black fabric paint to the Styrofoam ring with pipe cleaners. I added blue feathers (Joanne’s Fabric) and shells (Etsy) to hide the pipe cleaners.) I used 2 dreadlock wigs (Amazon & Wal-Mart) that I sewed together. I enhanced the dreads of the main wig by back combing, rolling, and hair spraying the dreads to give a more authentic dreaded look. I added a verity of feathers, beads, and shells (Joanne’s Fabric, Amazon, & Etsy) to the dreads to create a tribal look. I also wrapped some of the hair with metal flower wire (Joanne’s Fabric). The chest piece is made from a black foam sheet and varies feathers. I also cut small plastic skulls in half (Michael’s) and sewed them on the chest piece. I hot glued shells to the collar. I used safety pins to attach the chest piece to a black shirt (Target). The bottom half of the costume is a corset skirt (Gameis), black skirt (had this for many years), yoga pants (Target), and a pair of black boots (bought a couple years ago from Torrid). The staff is made from an old wooden curtain rod (obtained from buying our house). I used a jigsaw to carve the rod and then stained the exposed wood with black fabric paint. I then took 2 foam skulls (Michael’s) and impaled them onto the staff. I didn’t need glue because the staff provided enough support. I used a piece of cheese cloth table cloth (Target) to cover the large skull and added mesh ribbon, feathers, and beads (Joanne’s Fabric) to add character. I used metal flower wire to hold the beads and table cloth in place. I added more feathers, beads, and bones (Michael’s) to the staff. I also wrapped the staff with another piece of cheese cloth table cloth (Target). Makeup- the prosthetic skull (Mostlydead.com) is applied with spirt gum and then painted with Mehron face paint. The remainder of the makeup is also Mehron in the colors of black, white, and red. This makeup is set using Mehron setting powder. The black sclera contacts came from Sclera-lenses.com. Voodoo Doll- my husband is the wearer- The base of this custom is a pair of black skinny jeans and black long sleeve shirt (TJ Max). I used burlap (Joanne’s Fabric) to cover the clothing. I hand sewed the burlap on with black thread; but after seeing the final look I decided to go back and sew the seams together with black yarn (Joanne’s Fabric). The black yarn added more dimension to the costume that was easily seen from far away. The hand and feet covers are burlap that are pinned to cover the hands and feet. The mask is a bald cap that is used to cover the hair and ears. Burlap is applied in pieces with latex and then sewn to give the same effect as the clothing. The mask is literally stitched in place making removal possible only by cutting the seams. I applied black face paint to the eyes. This application was worn on Saturday Night the 28th. For Halloween I tweaked the mask by leaving an opening for the mouth and covering the neck more and adding black makeup to the mouth area. I continued sewing the pieces of burlap together with the black yarn. The pins are made from chopsticks (local Chinese restaurant), Styrofoam balls, Styrofoam glue (Joanne’s Fabric), and yellow hairspray (Wal-Mart). We stuck the pins threw out the burlap. The reactions we received were amazing!! This year we were fortunate to be able to dress up twice. We scared a few people, made others laugh uncomfortably, and there were a few people that wouldn’t look the Priestess in the eyes. On the 28th we wore our costumes out to a local restaurant and bar to compete in their annual costume contest- we won 2nd place. Restaurant goers and bar patrons were shocked by our costumes. People were amazed that they were handmade and the coyote skull was real. On Halloween we joined our friends at their annual Halloween Party. They live in a very busy neighborhood that is filled with children treat or treating. We passed out candy to some standoffish children that approached us with caution. The parents got a good laugh out of their reactions. After the children went home we headed to another local establishment that was hosting a costume contest. Upon arriving, the place was filled with amazing costumes- creative, terrifying, funny, and just plain brilliant. Throughout the night we were asked by countless patrons to pose for pictures. Everyone that spoke with us had kind words of admiration to offer. We entered the costume contest which was crowd judged- we won 3rd place overall. Both nights were amazing and makes me long for next Halloween!! We can’t wait! These costumes took over 500 hours to construct. They cost approximately $150 for the Priestess and $50 for the Voodoo Doll. You guys looked amazing and we love you! Wow! That is an awesome costume. Linz is my cousin, an I think she does an awesome job at making her an her husband's costumes. She starts early an puts a lot of time an effort into making them.